The Hilton Sukhumvit Bangkok hotel is ideally located on Soi 24 in Bangkok's trendy Sukhumvit district. It is 5 minutes walk from Phrom Phong BTS station, providing guests with easy access across Bangkok. 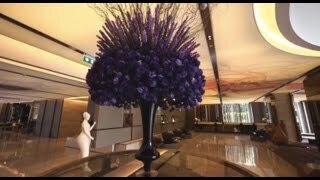 This video provides a great introduction to the hotel, from its 1920s Italian American design to its speciality restaurants. Hotel exterior view within Sukhumvit neighbourhood. Guest car arrives at hotel main entrance. First-person perspective of walk-in to hotel lobby. Focus on lobby layout and design features. Staff making preparations for service at Mondo open kitchen. Focus on cuisine served at Mondo. View of Mondo outdoor terrace. View of bathroom with sink and bathtub. First-person walk-down from hotel's feature staircase to Scalini restaurant. Kitchen staff in action at Scalini open kitchen. Focus on table arrangement and set-up at Scalini. Team member walking in through entrance to Executive Lounge. View of outdoor rooftop pool. Close up on design elements of the pool. The Hilton Bangkok Sukhumvit features stylish Deluxe Rooms offering a relaxing environment after a day in the city. Unwind in front of your 40-inch HDTV with cable channels or catch up with work at your desk. 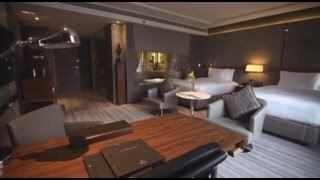 Watch this video to walk-through a Deluxe Room at the Hilton Sukhumvit Bangkok. First-person perspective entering in to Deluxe Room. View of bed with glass window looking into bathroom. Focus on room design elements. View of bathroom layout with sink and bathtub. Book an Executive Room and enjoy exclusive access to the Executive Lounge where you can enjoy complimentary breakfast, afternoon tea, evening cocktails and 2-hours use of the meeting rooms. View this video for a first-person view of our Executive Rooms. First-person perspective of walk in to Executive Room. Focus on bed and sitting area. Layout of bathroom with sink and shower. Second perspective of bathroom with sink and bathtub. Final view of Executive Room layout. Spoil yourself in a contemporary Suite, which features a spacious separate living room and working and dining areas. Enjoy exclusive access to the Executive Lounge where you can enjoy complimentary breakfast, afternoon tea, evening cocktails and 2-hours use of the meeting rooms. 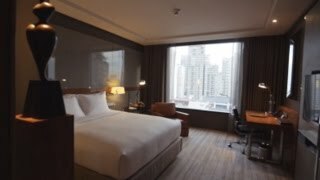 Watch this video walk-through of a Suite at the Hilton Sukhumvit Bangkok. First-person perspective of walk in to hotel suite living room. Focus on design elements in the suite. Focus on dining room table. First-person walk in to bathroom. Focus on bathtub and bathroom layout. Final view of bedroom layout. Hilton Sukhumvit Bangkok features 7 unique meeting and function spaces - from our Ballroom all the way up to the Summit, located on the 25th floor of the hotel with New York penthouse design. 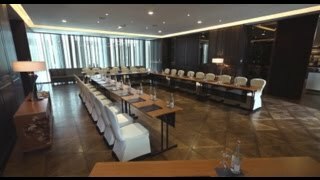 This video showcases our meeting spaces, with different set-ups to help you visualise your own event. Layout of Study meeting breakout area. First-person perspective of walk-in to Ballroom. Layout of classroom set-up in Ballroom. Layout of the Summit, on the 25th floor. Boardroom set-up in Summit meeting room. Layout of the Summit 'living room'. Doors opening to reveal multiple meeting rooms at the Summit. Final view of meeting room set-up. Allow Hilton Bangkok Sukhumvit to host your very special day. 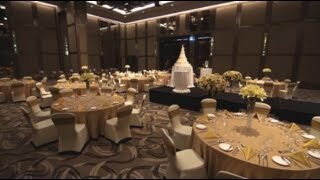 Watch this video for a glimpse at how we set up our function spaces to provide the ideal setting for your perfect wedding. View of hotel suite with wedding dress. Layout of the Summit function space, on the 25th floor of the hotel. Wedding set-up at the Summit function room. Team member opens door to banquet set-up in adjoining function room. First-person walk-in view through Ballroom foyer. First-person walk-in to Ballroom with wedding set-up. Wedding set-up in the Ballroom. Focus on table layout and arrangements. Final view of wedding set-up.